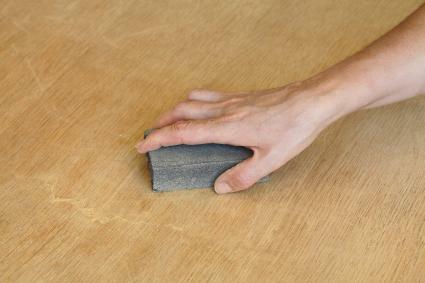 You can paint particle board furniture with a little preparation to ensure a smooth finish. This is a great way to give a favorite piece of worn, tired furniture a second life. Before you can begin painting, you'll want to prepare the furniture by sanding and filling in any blemishes, nicks or rough edges. Many pieces of particle board furniture have a laminate coating for the finish. If the furniture you're painting has this type of finish, blogger and furniture re-styler Denise at Salvaged Inspirations stresses that it's very important to sand it. This will ensure the primer adheres. Even if your furniture doesn't have this type of finish, you'll still need to scuff it up with sandpaper before priming. Use a piece of 120 grit or 220 grit sandpaper or pad. Don't over-sand. You don't want to expose the particle board, just sand the finish enough so paint will adhere. With a soft, clean cloth, wipe the furniture to remove any dust particles. You should next address any dings, blemishes and imperfections of the wood. The nature of particle board makes it easy to chip or get dings, since it is composed of wood particles molded together with an adhesive. Take a dab of joint compound or spackle on a palette knife or the tip of your finger (wear plastic gloves). Rub the joint compound into the gouged area and smooth with a palette knife. Allow the compound to dry according to manufacturer's directions. Once the compound is completely dry, it's time to sand. You want to sand very lightly to smooth out the compound in preparation for painting. Remove debris with a clean, soft cloth. 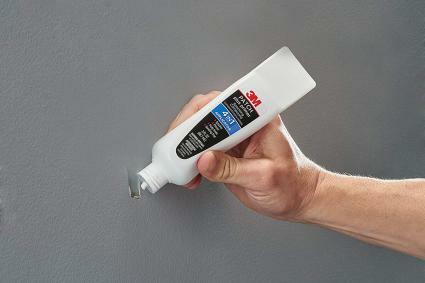 Ace Paints advises that a primer is key for paints to adhere to the surface. Since the processing of wood particles/chips means the finished product is porous, you'll need to prime the furniture before you can begin painting. Use either a lacquer or oil-based primer, since a latex-based primer will result in the wood absorbing the moisture and swelling. However, you can skip this step if you're using a chalk paint, since it will adhere easily to most surfaces without the need of a primer. You can use an oil, lacquer or latex paint for the furniture. 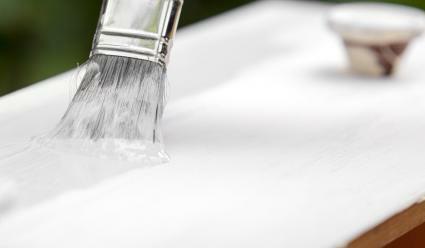 If you are applying more than one coat, allow adequate drying time between coats according to manufacturer's directions. 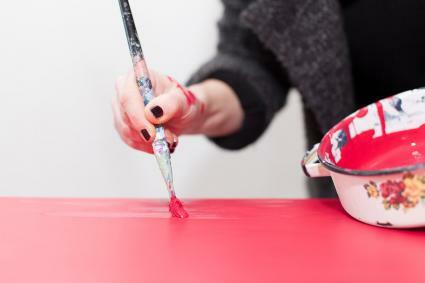 Lightly sand between the coats of paint and clean away dust with a cloth. Krylon Paints offers a good quality spray paint made specifically for furniture. The paint can features a spray dial that can be turned horizontally for surface painting and vertical for spraying the sides of furniture. If you're using chalk paint and your furniture doesn't have a laminate finish, then you can simply paint the furniture. Chalk paint is designed for this type of application. However, Shaunna of Perfectly Imperfect blog states that she has successfully used chalk paint on laminate furniture without the need to sand and prime. She does advise to use two coats of paint and applying a wax finish. If in doubt, simply use a test area to see how the chalk paint adheres to a laminate that has been sanded. You can repair a particle board table with glass rings from the condensation of sweating drinking glasses. These rings may appear to be permanent, since the moisture will have made the particle board swell. If the stains are recent and haven't dried out, use a handheld hair dryer to dry the wood. If the ring caused the wood to swell so that the ring areas is raised above the surface, you'll need to sand with a medium grit sandpaper (60-100 grit). Sand the raised areas until it is level and smooth with the rest of the surface. Use a clean cloth to remove dust residue. Some warped particleboard can be salvaged and straightened. If the wood is warped due to moisture, you need to place it on a flat surface and allow to dry. You may need to add weight on top of the board so it will dry flat. Once dried out, sand any bubbles or remaining raised areas. For warped shelves, it's best to replace these with new particleboard shelving. You can paint particle board furniture when you take the steps to sand and use the right type of primer. 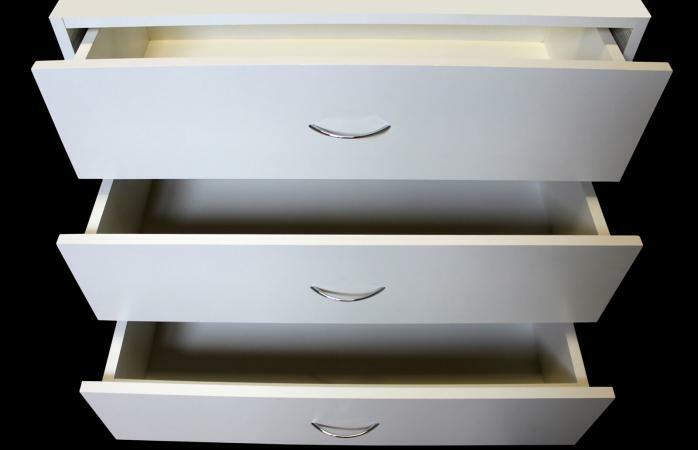 Don't be afraid to give particle board furniture a new life with a new paint job.